Cameron Tartan Ribbon is available to buy in 10mm (3/8"), 16mm (5/8"), 25mm (1") and 38mm (1½") widths on 25 metre (approx 27½ yard) reels. The Cameron Tartan Ribbon sold by tartan-ribbon.com is top quality, authentic Scottish tartan ribbon as certified by the Scottish Tartans Authority. Cameron of Lochiel (Hunting) Tartan Ribbon is also available in 12mm (1/2") and 38mm (1½") widths on larger 50m (55yd) bulk reels. Please note that tartan ribbon supplied 50m bulk reels is from a different manufacturer and stocks are limited. The Cameron Tartan Ribbon shown is the Clan Cameron variant. 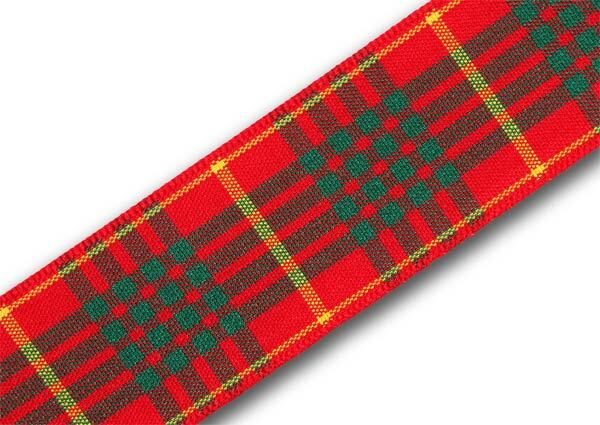 Cameron of Erracht Tartan Ribbon is also available.